Where a close fitting awning is required this is a great choice. With narrow projection into walkways or in places where space is at a premium these are ideal. 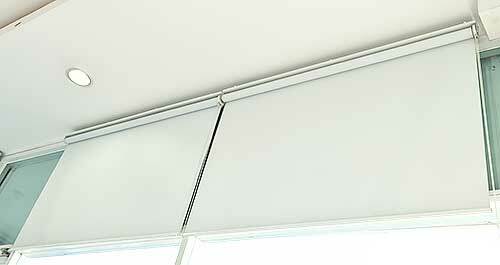 Made to shade windows from direct light and still allow breezes to enter the automatic awning is the premium choice. Easy to operate self-locking arms allow the automatic or fixed guide awning to be positioned where it is needed to provide optimum sun protection. At the end of the day or in winter the awning can be rolled up to maximise the benefits of the winter sun. Made with durable fabrics that retain their colour for years to come the awning can be made to complement the existing colour scheme. Corrosion resistant tube sections and side guides are used. Optional Stainless steel and aluminium components can be offered for aggressive coastal applications. An optional colour coded headbox can be supplied for more complete protection of the awning. We can supply our automatic or fixed guide awnings in a variety of materials and colours to suit your situation. Retractable Awnings skins can be made from long lasting colour fast polyester/nylon blends, acrylic or canvas fabrics in either water resistant or water repellent grades and in either plain or patterned design or in Clear or tinted PVC. Automatic or fixed guide awning operation is manual with automatic locking arms. The benefits of fitting automatic or fixed guide awnings include cutting down the heat, reducing household bills, reducing fading on furniture and carpets, allowing windows to stay open in rainy weather as well as increasing privacy.